The entrance from Sunrise Valley Drive to the 1,745-space Herndon-Monroe Park and Ride is scheduled to close Friday for two weeks, forcing bus detours and requiring some drivers to pay for the Dulles Toll Road. WASHINGTON — The entrance from Sunrise Valley Drive to the 1,745-space Herndon-Monroe Park and Ride is scheduled to close Friday for two weeks, forcing bus detours and requiring drivers who still want to use the parking garage to pay for the Dulles Toll Road. The construction detour is part of work on the new parking garage Fairfax County is building there to serve the Herndon Silver Line Station. The second phase of the Silver Line from Wiehle-Reston East through Dulles Airport to Loudoun County is expected to open in late 2020. Construction on the rail line is being managed by the Metropolitan Washington Airports Authority. 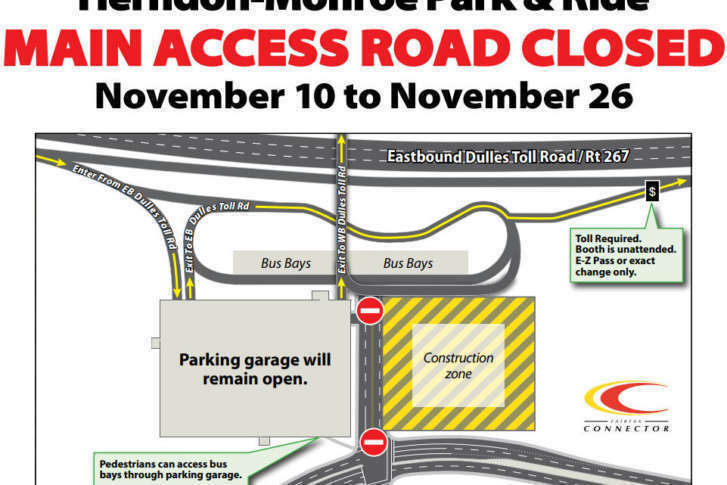 During the closure of the main entrance to Herndon-Monroe from Nov. 10 through the end of Thanksgiving weekend Nov. 26, Fairfax Connector routes that stop at the Herndon-Monroe Park and Ride are expected to be significantly delayed. Stops along Sunrise Valley Drive at Colt Brook Drive, Milburn Lane and Thunder Chase Drive will be skipped. Those riders can walk to the park and ride facility to catch a bus since Fairfax Connector routes will still stop at the facility. People who are usually dropped off at the park and ride lot can be dropped off or picked up on Sunrise Valley Drive, just outside the existing parking garage. The Fairfax County Department of Transportation suggests drivers who do not want to pay for the Toll Road or deal with longer delays during the closure instead consider using the small Reston South Park and Ride lot or the garage at the Wiehle-Reston East Metro, which costs $4.95 on weekdays. Parking there is free on Veterans Day and Thanksgiving. Metrobus Route 5A, which usually runs between L’Enfant Plaza, Rosslyn, Herndon-Monroe and Dulles Airport, will not stop in the park and ride bus loop on the way to the airport during the closure. Instead, the westbound buses are scheduled to stop on Sunrise Valley Drive just outside the closed entrance to the park and ride lot. 5A buses heading eastbound toward Rosslyn and L’Enfant Plaza are scheduled to stop in the park and ride bus loop as usual, since the entrance and exit from the Toll Road are going to be open as usual. On Friday, the first day of the closure, Metrobuses will run on reduced Saturday supplemental schedules for Veterans Day. Fairfax Connector routes run on holiday weekday schedules. MARC trains in Maryland run on an “R” schedule, but there is no VRE service on Veterans Day.